Detectives today urged four possible witnesses who may have 'crucial information' about the disappearance of student Libby Squire to come forward. The 21-year-old student went missing in the early hours of February 1 after a night out - and a huge search operation in Hull has failed to find any trace of her. Now, Humberside Police believe the four men - who were in the area of the city where she was last seen - 'may have seen or heard something that could be vital'. 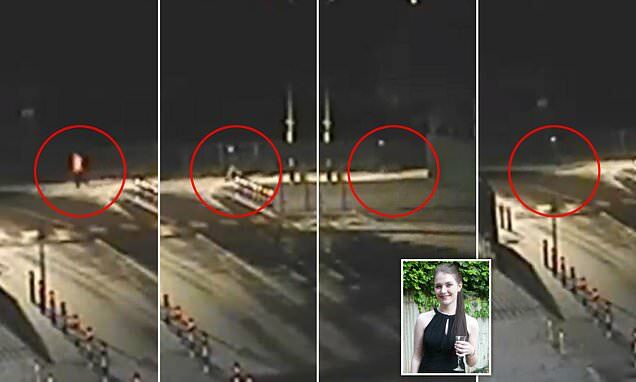 CCTV footage shows four people on Oak Road near the junction with Clough Road, close to where Miss Squire was last seen, between 1.13am and 2.34am on the morning she vanished. The Oak Road playing fields have become a focal point in the search for Miss Squire over the past three weeks. This afternoon, Detective Superintendent Martin Smalley said: 'These four people are potentially witnesses who we need to identify and speak to as part of the investigation. He urged the four people to identify themselves to police, saying they seem to have been travelling in the direction of land that has been widely searched by officers. The first clip shows an individual, believed to be in a light coloured T-shirt and dark trousers, at first running into view on Oak Road and then walking away at 1.13am.